It drives me crazy when people do boneheaded things. Here is a signed, limited edition copy of Chuck Palahniuk’s book Rant for sale at the Watertower Place Border’s in Chicago. The book is priced at $150. Now I don’t really have any interest in Mr. Palahniuk’s books (he also wrote Fight Club), but other readers would no doubt be willing to pay that price for this edition. (The slip cover is very cool I must admit.) But the folks at Border’s seem to be doing their best to ensure that no one will ever want to pay $150 for this particular copy. First, they don’t keep it somewhere special to keep customers from banging it up (notice the dents in the upper left corner). Second, they slapped the price tag on the slip cover itself gumming it up and leaving scratch marks where customers have tried to peel it off. And third, and most stupidly, they wrapped a security device around the book leaving a big crease in the edges of the slip cover along the book’s spine. 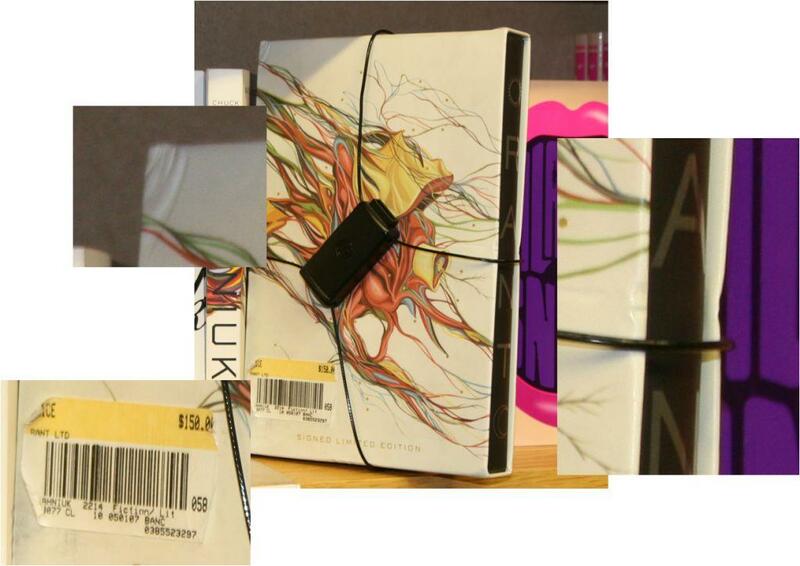 As a booklover it annoys me that a special edition would be treated with such carelessness. But what about Border’s corporate overlords? Surely they wouldn’t be happy knowing that their valuable stock is being ruined, or at least dimished in value by employee stupidity.